If you’re like many small local business owners right now, you are beginning to see a decline in many facets of your online marketing presence. Whether it be traffic to your website, engagement on social media or actual foot traffic coming in your door, small business digital marketing is taking a hit if your current methods are not following the most recent changes. As online marketing changes, the strategy, platforms and tactics being used have to migrate right along with them if your local business is going to be seen and experience good results. When small businesses are not able to keep up, their competitors who are, tend to get more of the eyeballs and traffic you used to get. That’s where a professional digital marketing agency for small business makes the difference. When it comes time to hire a digital marketing agency for your small business, it can be quite overwhelming. I mean let’s be real here… If you are not a small business digital marketing agency, how are you going to know what you need to look for in a marketing company? How are you going to know which digital marketing agency for small business is right for you or more importantly whether that small digital agency will be effective. We could go on here, but we are guessing you have already thought of these questions and issues and that has been one of the reasons you have continued to try to do your own small business marketing yourself. Internet marketing for small business has become as complex and challenging as digital marketing for larger brands. The challenges are comprised of the time, experience and knowledge required to get results, coupled with the continual and complex changes that each platform and marketing channel go through. For example: Several times each year search engines make drastic changes to their algorithms that determines how they return search results. If you are not aware of these changes and how they affect your search results, and/or are unable to quickly make the changes to your local website that are necessary, your online marketing results will diminish. If you let these changes pile up unresolved the results can be far more drastic to your small business. Finding and selecting the right online marketing company for your small business is crucial. Picking a small business digital marketing agency that has the real experience to get your digital marketing ontrack isn’t as easy as you might think. Here are some considerations that will help you make a better choice. Talent and experience is what makes small business marketing get results. The digital agency you choose should have the people that not only have the experience, but also have unique talents within the marketing space. Uncovering the right local marketing agency with the right people is done through research. Who are the people behind the small business marketing company and what is their online reputation. Are they recognized as leaders in the industry and is that reputation reputable? Is The Marketing Company Doing Good Marketing Themselves? It’s helpful to understand that when you hire a small business online marketing firm, you are essentially paying for two main things, their knowledge and their time. The more experienced the small business internet marketing company is, the more knowledge, expertise and talent you will typically get. That expertise should be reflected in the agencies own digital marketing, website presence, content marketing, blog and social media activity. If the digital agency you are considering is not doing exceptional online marketing that is geared specifically toward you the small business owner, then you should be very leary of working with them. 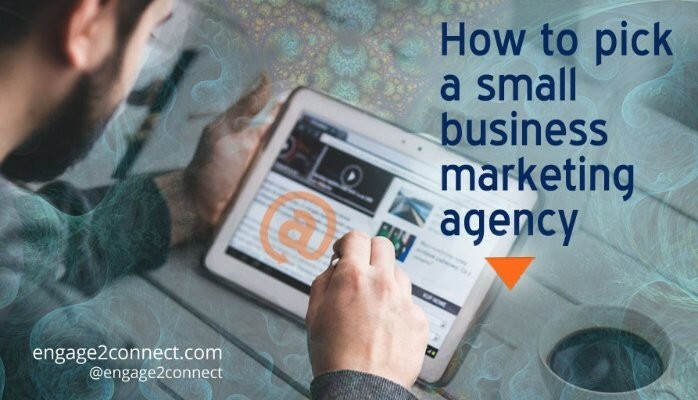 If their own marketing isn’t getting done effectively and covering all of the main digital marketing channels, how can you expect them to be capable of doing that for your small business? Furthermore, watch out for the marketing celebrities. Online marketing celebrities are about being known and popular and spend most of their time being highly active on social media and creating content that engages their peers and competitors but doesn’t address the target customer they say they work with. Ask yourself if you were a professional marketer and doing exceptional marketing for small business owners in local markets across the country, would you have time to waste taking 20 selfies per day or recording 30 snap chat videos about your walk to work? Would you have the time to comment on all of your competitors social media posts? As small business marketing professionals that do great work for our clients, we can assure we do not have time trying to be celebrities with our peers. We are too busy getting real results for our small business clients. Finally, use a little common sense when you pick a company to do your small business marketing. The age-old saying “You get what you pay for” really needs to be conjured. In fact, we have never seen cheap digital marketing, actually get a small business real results. Furthermore, the digital agency that you select should be able to point to data and results they are getting for other clients that go beyond the fluff of website traffic and number of likes. When you invest in your small business marketing with a top agency, you can expect that you are going to get real results that impact your bottom line. If you are not willing to invest in proper integrated digital marketing with a top agency, we’re willing to bet that your results will reflect that decision. It is just a fact of the complexity of digital marketing today and it is only going to get more challenging from here. Pick your online marketing company wisely so they end up being a partner you can rely on!